Albert van der Sel : Some keypoints of Relativistic Mechanics. In the series: Note 2. Subject: A simple note on the Special Theory of Relativity (STR). it is optional reading for folks who only like to learn "practical" physics quickly. Then you can skip this note, which is no problem, and go for later notes. like the basics of vectors, some calculus etc.. This note: Note 2: Some highlights from Relativistic Mechanics (STR). to Quantum Mechanics, Particle physics, and much, much, more. However, he is ofcouse most well-known for his theories of Relativity. uniform or constant velocity with respect to each other. This, combined with the realization that "c" is "c" at all "frames of reference", led to a different perspective on SpaceTime. The "Special Theory of Relativity" was Einstein's first theory of Relativity, and was published in 1905. The General Theory of Relativity (GTR) is indeed "more general" since accelerations between "frames of reference"
are considered too, or in fact, is the main theme. Through elaborate deductions, Einstein argues that SpaceTime is curved, due to "mass-energy", which results in "gravity". The "General Theory of Relativity" was Einstein's second theory of Relativity, and was published in 1915. Chapter 1. The classical Galilean Transformation. Chapter 2. Speed of light. Chapter 3. Minkovski SpaceTime and Distance. Chapter 4. The core: Lorentz Transformations and STR. Chapter 5. More about Causality. 1.1 What is a Galilean Transformation? For example, you can be stationary in frame S, which, as far as you can judge, is in rest. Then you watch frame S' passing by, which moves along with a constant speed. or the direction defined by (1,-2,3) or whatever else direction. It does not matter at all. The only requirement we need in this chapter, is that the relative speed between S and S', is constant. For the purpose of this chapter, any direction where S' is moving to, is OK. So, for simplicity, we can simply just assume that S' moves along your +x direction. Let's further assume that S' moves with 5 m/s (relative to S). Note that an observer in S', might say that it is frame S, which is moving with 5 m/s to the -x direction. Let's assume that S uses the coordinates (t,x,y,z) and S' uses (t',x',y'z'). is the same everywhere, in any moving frame of reference. This is so true from a classical standpoint. However, for the spatial coordinates, it is a bit different, and fully normal from a classical viewpoint. Suppose, in your system S, you describe the point A by (5,2,5), meaning x=5, y=2, z=5. However, an oberver in frame S', sees point A moving with a constant speed in the -x direction. (0,2,5) when 1 second has passed, (-5,2,5) when 2 seconds has passed, (-10,2,5) when 3 seconds has passed etc.. etc.. Note that the observers in S and S both see that the "y" and "z" is the same for both frames. For the spatial coordinates (x,y,z) or (x',y',z'), these relations must be true. And indeed, by using classical logic, it must also be true too, that t'=t. The set of equations above, is often referred to as a "Galilean Transformation". Figure 1. Frame of Reference S', moves with speed "v" (along the x-axis) relative to S.
1.2 Invariance of Physical laws under Transformations. You have to admit this: if physical laws are different in S and S', we would have a real problem. The observer in S simplys says that it is S', which is moving with 5 m/s to the +x direction. is moving with 5 m/s in the -x direction. Who is right? Impossible to say. F=ma, or the laws of Maxwell (electrodynamics) etc.. etc.., have to be invariant. A well-know example is to look "how good" F=ma will hold under transformations. Let's say that a mass "m" is in space, where S and S are in too. Let's suppose a force F acts upon that mass. An observer in S says that F=ma holds. An observer in S' says that F'=m'a' is true. An observer in S' says that F'=ma' is true. an object has the same mass as when it was still on the runway. The whole of classical mechanics, treats mass as a constant. We don't know any better that that. Thus: is it true that F' = F? (which is a logical and very resonable assumption), then in equation 2 above, we replace t' with t.
Note that the term in "red" "d / dt ( d(vt) / dt )" is "0", since "d(vt) / dt" is "v", which is constant, and d/dt of a constant, is zero. So, F=F' in all frames of reference which move with a constant speed relative to each other. are invariant for a Galilean Transformation. 1.3 Addition of velocity vectors (or speed) from a classical viewpoint. Suppose you are sitting in a train which has a speed of 50 m/s, relative to the track. then your speed relative to the track (or relative to the surface of the Earth) is 50 m/s + 5 m/s = 55 m/s. is along the direction of a moving frame of reference. Figure 2. In this example S' is moving in the +x direction with 20 m/s, relative to S.
In this case, an observer in S sees that frame of reference S', is moving with 20 m/s into the +x direction. So, "everything" in frame S' (including bow and arrow), is moving with that speed, relative to S.
it is S which is moving into the -x direction with 20 m/s. So in S' people would say: the arrow goes with 30 m/s into the +x direction. that the arrow already possesed, and the extra 30 m/s due to the power of the bow. But this is already we all know what is true. We see it in daily life all the time. are moving in the same direction. Now, the startling thing is, that this does not work with ElectroMagnetic radation, like radiowaves, light, x-rays etc.. In this case, such "radiation" travels with "c" (the speed of light), and "c" only. direction as S' is moving to. For observers in S and S', that signal simply has a speed of "c". The speed of "c" (the speed of light) seems to be completely unrelated to the speed of any observer. reach the conclusion that the speed of light is "constant". The speed of light in true vacuum, called "c", is just slightly below 300000 km/s (3 * 108 m/s). It is absolutely fenomenal that a Danish astronomer (Romer), already in 1676 determined that the speed is somewhere about 225000 km/s. He used the eclips of the moon "Io" around Jupiter. The Earth revolves around the Sun in one year ofcourse. the line of sight with Jupiter. By comparing the time difference at such eclips, at moments that the Earth is near or far, Romer came to his conclusion. Note how ingeneous that was. Ofcourse, at much later years, the speed was determined with increasing accuracy. needed a fixed medium, the "ether" (or "aether"), for "propagation". are propagating ocillations that use a "medium" for their expansion. Countless of other of such observations exists. It was quite reasonable in those days, that the same sort of thing must be true for EM waves too. The "Michelson and Morley" experiments. One of the first "cracks" in the idea of a fixed "ether", arose with the experiments of Michelson and Morley. Ironically, those researchers actually did the experiment, with the expectation that it would prove the existence of such an "ether". then using an ingeneous experiment might prove it to be true. Again, it was used that the Earth revolves around the Sun, with an orbital speed of 20 km/s. Now, in a span of 6 months, the speed of the Earth is opposite than it was 6 months before. to the different speeds of the Earth in 6 months difference. The experiment was indeed set up in such a way, that differences would be greater than the experimental margins of error. However, no difference was found ! By the way, in later years the experiment was often repeated, using different setups, with ever increasing accuracy. In the years close to 1900, it is indeed true that physicists who were involved in this field, we quite puzzled. that the speed of light is constant, and independent of the speed of the observer. Note how "un-classical" this is, with respect to traditional classical mechanics. The "Gedanken" experiment of Einstein. Einstein passed away in 1955. However, some footage exists where we can hear the master talk. where he told the viewers of a rather remarkable moment in his early life, way before he published any of his theories. of that particular moment, that particular image of the clock, "would be captured", "or frozen" in some way, traveling for ever. As if time itself was frozen or was halted. It seems that such event contributes to the early thoughts Einstein had, about Space and time. Einstein felt that Space and time are not fully seperate, but connected in "SpaceTime". no matter which frame of reference is used. Exactly this, will be explained in Chapter 3.
has "shifted" somewhat, for some scientists, to a (sort of) newer interpretation. actually the "transmission of information", which cannot exceed the speed of light. and that is also governed by means of how information can be "distributed" (so to speak) among processes and events. As to how fast an individual "pure sine like" wave travels, is not so relevant: it contains no information. Information "sits" in how (for example in EM waves) frequencies or amplitudes are modulated in carrier waves. An individual "harmonic", or pure single wave, among a "group", might theoretically" even go faster than "c". fraction higher than in regular vacuum c.
But at the same time, it is shown that it does not hold for information transmission. So, it does not matter at all. Einsteins law is not breached. Keep in mind that the latter alinea is fully theoretical, and is never tested or proven. Many physicists also reject such a line of thought, while some still persist in such a view. the speed is be only 0.75c (where c is always the speed in vacuum). the photons "collide" with the electrons of the atoms of the material, en gets re-transmitted again. Overall, that consumes time, and is considered to be a fair explanation, among physicists. the way we must view "c" in the framework of STR. The "true" speed of light, as the absolute constant, is considered to be in "vacuum". There are still some "uncertainties" as to what the vacuum exactly is. For example, the concept of "vacuum fluctuations"
As to "how" this would have any effect on the speed of light, is "really" still not fully covered. or SpaceTime, whether the best theory would turn out to be "superstring theory", or "Loop Quantum Gravity", or something else. This too is still not fully covered by any theory sofar. ε0 and μ0 which represents the "vacuum permittivity", or "permittivity of free space". These constants say "something" about the capability/ability of the vacuum to permit electric- and magnetic fields. Whether the relation is truly fully exact, still seems to be a subject of debate among physicists. a view is not shared by all physicists. I am not suggesting that "c" can be exactly calculated from ε0 and μ0, or the other way around. It's just such an equation that couples constants, and it seems to suggest that a constant "c" is a property of the Vacuum. I have to confess that I like such discussions, and that is probably the reason why I have put it here. That probably holds even more for the following subsection. But you are strongly encouraged (by me) to do some further explorations on this facinating subject. I am not going to say anything here, about the Planck's Length. But I think it will add "something"
to the discussion about the speed of light, why it is always constant, and why it is so important. If "Planck's Length" really is unknown to you, you might consider to do a websearch, and read some articles. You won't regret that, I am sure. what possibly the role of "c" can be here. However, it's not neccessary for this note. Chapter 3. Minkowski SpaceTime and Distance. Let's spend a few words on the "Minkovski SpaceTime", since it plays an important role in the approach to STR. like the "length" or magnitude of an ordinary vector, and the "distance" between points. The "magnitude" of vector A is often denoted as |A|, but some other notations go around too. which connects those two points, clearly determines the distance between them. simply is the distance to these points defined by P and vector P'. In general, a "distance", is quite often denoted by "S" or "s", or in infinitesemal form "ds". Minkowski SpaceTime is a four-dimensional space, 3 spatial coordinates an one additional time coordinate. You can view it like "just" "another" a four-dimensional space ofcourse, but that's not really the plan. It is meant specifically to specify events, possibly linked by "lightsignals". and another observer recieving that lightpulse. This then would form a connection, or a distance, between those two events (points). A point, or event, in Minkowski SpaceTime can be notated as (x1,x2,x3,x4). the usual 3 spatial coordinates and one time coordinate. that light travels, measured over a standard time, which actually then "functions" as a component distance, just like "x", or "y" etc..
Now, we may have a point, and another point, over which we can easily define a "distance" between those points. the familiar Euclidean case, but this time the "path" of a lightsignal must be incorperated too. but that must equal the distance covered by the lightpulse: c(t2 - t1). Formally, equation 7 is called "the interval", which is "0" in every frame of reference. the Minkowsky distance between events is always the same. Remember that an event might be viewed as an observer (or source) sending a lightpulse, and another observer recieving that lightpulse. This distance, between those two events, is the same as viewed from any frame of reference. So, in Minkowski spacetime, all observers in all frames of reference will agree on the distance in SpaceTime between events. of the Galilean transformation in this relativistic perspective, like expressing x' in terms of x and t.
be the same as viewed from frame S. I try to prove that (or better: I try to make it plausible) in Chapter 4. We are up now for some highlights of the core of STR. The law of physics are the same in any frame of reference. or y direction, or any other direction (like the direction where a frame of reference is moving to). The speed of "c" in vacuum is totally independent of the speed of any frame of reference. Einstein further took nothing for granted. Again, we will consider two frames of Reference, namely S and S'. S' is moving with speed "v" along the +x direction (when viewed from S), just like in Chapter 1. Precisely when S and S' coincide, a "light-explosion" from the Origin occurs. The will create a spherical wavefront. x2 + y2 + z2 = (ct)2 = c2t2 (equation 8). x'2 + y'2 + z'2 = (ct')2 = c2t'2 (equation 9). in the dimension in which we indeed have a "speed" ("x"), we will see a large effect. But in the transpose directions, thus in this case the directions "y" and "z", there is no effect at all. in the dimension(s) as to which the frames of reference are moving with repect to each other. In our case, movement is along "x" (or "x'") direction only. the same is true for an observer in S'. This is a direct consequence from the fact that the speed of light is constant, in every frame of reference. so the classical way to add velocity vectors does not hold. Since the speed that light travels, is the same everywhere, both equations means the same "distance". with the Galilean transformation (like equations 1-4 of chapter 1). So, finding those, is our next goal. There quite a few "variants" of finding the set of relations which expresses x' and t', in terms of x and t.
Although those approaches may seem different, they all ultimately must satisfy equation 16.
each individual mathematical step in such process. One constraint on the sought after relations, is that they must converge to the Galilean Transformations when v<<c. What often is done to find the relations, is expressing x' and t' as linear function of x and t.
-That is mathematically not strange, since equations like equation 16, have linear functions as a solution. then one have to try more complex ones. out to bee an exact solution, then it's actually not an approximation, but the real solution. functions would give multiple solutions (that is multiple x''s and t's) for the same x and t. That would be truly weird. we can use that as a check later on, if our solutions found, are indeed valid. The movement of S' is constant with respect to S, and we are so 'smart' to single out some "special moments"
and use those for further processing of equations 17-20.
along x', Δx' in S', as seen from S, is contracted. And, we also "strongly" suspect that clocks in S' run slower, as seen from S.
So, we may say, from a relativistic viewpoint, that it must be that x' = γ x and t' = γ t.
Indeed, we may call "γ" a relativistic factor. And suppose that we are wrong and there is for example no length contraction, then γ must be "1". 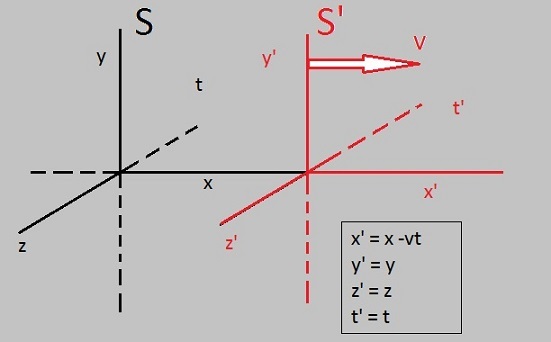 For an observer in S, it still remains a reality that S' moves with speed "v" into the +x direction. For any precise time "t", at the Origin of S', or the point where x'=0, we have x=vt. This is just one of those "special moments" I was referring to above. 0 = γx + δt => γ vt = -δ t => γ = -δ/v => δ = - γv. Believe it or not: equation 21 is the first of our 4 sought after Transformation equations. However, we already also know that y' = y and z' = z, so we are only looking for the time equation. Just one left. But I don't want to much clutter here, and it's not really neccessary, I think. In many articles, however, folks call γ = √(1-v2/c2), and equation 26 "the Lorentz factor". Equations 22-25, or equations 27-30, the are called the "Lorentz Transformations" (for "v" along the x-direction). Note that the " γ factor", to a high degree, determines the relativistic effect here. Take a look at the first equation (22) for x'. Note that if v is ver low, then √(1-v2/c2) is practiclly "1". Thus it means that the equations converges to the Galilean Transformations for low speeds. Next, we are going to explore the relativistic effects like "length contraction" and "time dilation". If "v" is very low compared to "c", then for example the "length contraction" is very low too, or even unnoticable. However, if "v" is very high, like 0.5c, or 0.7c, the "length contraction" is very considerable. In principle, you could deduce that from the Lorentz Transformations listed above. But we are going to play with a few examples in section 4.2. Length contraction refers to a moving object, which appears to look shorter when viewed in the stationary reference frame. If it is true that you see this "work" for the first time, I can imagine you will be somewhat amazed. Again, we have the frames of reference S and S', in the usual way. In S, we can define a certain "distance" or linesegment Δ x = L0 = (x2 - x1). Suppose S' was at rest first. Let S' have exactly the same linesegment, which thus completely coincides with Δ x.
and further keeps that speed "v" constant, along the +x direction. At a certain moment, S' will then pass along S, with speed "v". How does an observer in S, measures that linesegment L in S'? It's actually not so hard to calculate this. Note how the "vt" terms cancel out. Δ x' = γ Δ x.
will be equal to or smaller than the length in the moving frame (the primed frame S'). This is a matter of perspective. If you are "inside" S', thus moving along S', the length is fully normal. You are inside S' in which the object appears (and is) stationary. In such a case, you would say that it is the length in S, which is contracted ! γ is always > 1, or almost "1" if the speed "v" is very low. if the speed "v" is very low. Length contraction is observed from the stationary frame S, and to be in "effect" in the moving frame S'. So, always use "Length * √(1-v2/c2)" to get the length of the moving object. Usually, we write it in the following way. Suppose L0 is a distance or linesegment in S and S', where both are in rest. Suppose in S, we have L0 = 1m. When S' is in rest, we have the same distance L = 1m. Now S' moves with a constant speed of 0.7c along the x direction. 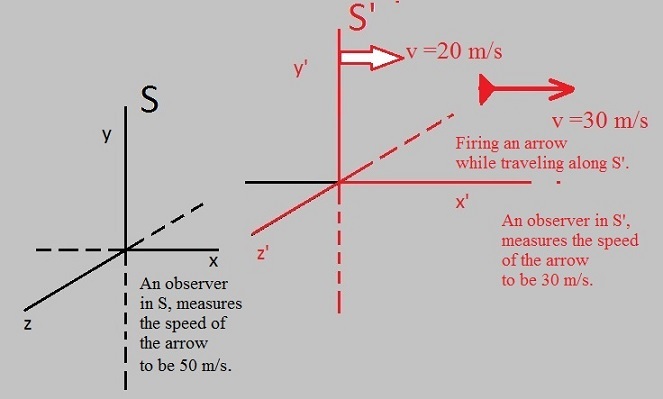 How long does a stationary observer in S, measures L, when S' moves with that speed? Now S' moves along the x direction with (only) 1000 km/s, which is about 0.003c. With low speeds, say below 0.01 c, relativistic phenomena are hardly observed. That's why Newtionian mechanics works great with speeds that are only small fractions of "c". It's not too hard to try for yourself to how time dilation works. Indeed, in the moving frame S', a clock will run slower compared to S.
Let's go for our last chapter, on "Causality". which can be used in all domains, that is, from extremely small distances, up to the scale of the Universe. hope that they can (eventually) describe or explain the World even better than those "grand daddy" theories. I like to talk about "causility" here, since it's also an important theme in STR. or the other, but it is reasonably fair to say that the β sciences are more involved (including philosophy). more thoroughly, and find another deeper reason for that cause etc..
For example, you see a force that caused a particle to get in motion, but what caused that force? You may say: that's not causality! But the stuff above is related. empirical events (possibly repeatable events). scale of the "Length of Planck". In these idea's, causality might have not the usual meaning. a path that is worth exploring. Now back to STR. All physicist say that it preserves "causality". Even stronger: the fact that exchange of "information"
is limited to the speed of "c", in all frames of reference, means that one cannot break causality. frames of reference, agrees upon. does not violate the theory. One good tool to check on causality are socalled Space-Time diagrams. In figure 3 you see two examples. One the x-axis, we see the axis of space (or just one dimension "x"). In such scenario, only events between the two red lines (the "cone"), can be causally connected. The boundary of the "cone", that is, the red lines, represent the distance covered when exactly travelling with "c". or at most "c" (on the red lines). there was a scenario where information travelled faster than "c". Causality is preserved ! This is depicted by the left figure. faster than "c". Causality is broken !